I'm still working on my "price zapping" sale to try to raise some money to help pay off mounting medical bills from my surgery. So, as you shop, watch for the lightening bolt sign...those items have been marked down...a lot of them below my cost, just because I need to raise some cash quickly. I'm marking them down a little at a time as I'm still a little lacking in energy. Keep checking back! I have a couple of pictures to share with you. This picture was taken right after my surgery. This is Molly (sitting), Tori (standing foreground) and Zoe "helping" my Aunt Susie eat her bagel. 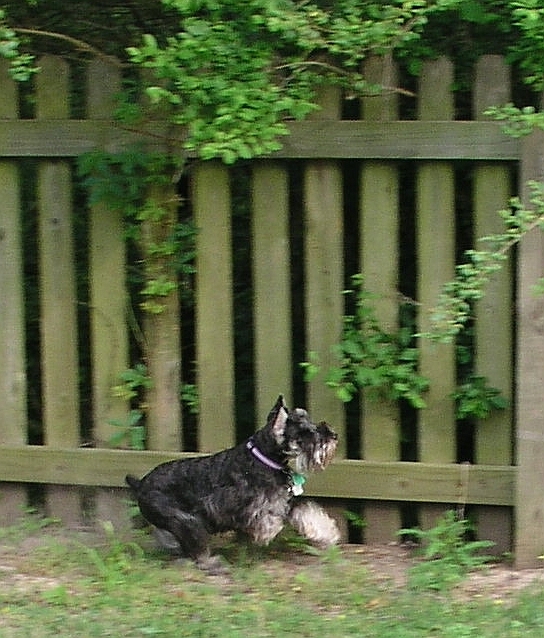 Schnauzers are very helpful dogs. Especially when food is involved. Don't you wish you could get your kids to pay attention like this? And this is Zoe, coming in for some loving. When she needs attention, she has no problem asking for it and I have to admit, I enjoy giving it. She's a snuggle-bunny and I'm glad! Isn't she cute? Zoe has become obsessed with squirrels and has appointed herself as head of the "death to all squirrels everywhere" squad. We have some really dumb ones, let me tell you. They are big, fat, waddling red squirrels and they are so big and fat (pecan trees...they're well fed), they don't move very fast. Consequently, Zoe caught one that barely escaped when I screamed for her to "leave it" (and she obeyed!!!) and she has come very close to catching numerous others. The chases are intense. Zoe is wholly focused on her prey. I'm focused on Zoe...praying she doesn't CATCH her prey. It's probably pretty comical, actually. Thank goodness no one can see me in the back yard as I gasp and squeal running after Zoe as she tears after these overstuffed specimens! Just yesterday, she treed a monster of a squirrel and she wouldn't come when I called her to leave her post at the base of the tree. She figured it was going to have to come down some day and she was going to be there waiting when it did! I walked over to the tree to retrieve her when the squirrel FLUNG itself out of the tree, landed with a thud that shook the earth as it hit the ground about 8 ft. out from the trunk and ran for it's life! It barely scrambled over the fence in time to escape the jaws of death hot on its tail! Zoe's obsession is fueled by these close encounters and tonight, she was at her post, staring intensely at an intruding squirrel who was taunting her from the back yard. I thought you would enjoy a picture. When they get closer to the door, she starts jumping up and down while barking furiously as she paws on the glass to be let out. If I can get a mid-air picture, I'll post it, but for now, here's "The Watcher." Love those bow legs!!!! I don't know quite what to think. I have encountered (and slaughtered) two snakes in my yard in one afternoon. Yesterday afternoon, to be exact. The first one was only about 10 to 12 inches long...but still, it's a SNAKE and they grow up quickly. He / she was quickly and efficiently dispatched to snake heaven without eliciting too many shivers up the spine. 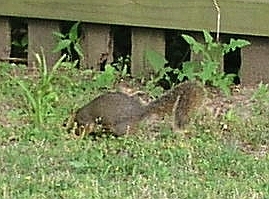 Then, about an hour later, a young adult came cruising through the yard. This one was about 3 feet long, eliciting many shivers and quivers and uneasy feelings. It didn't run either, which always bothers me. I want snakes to be as afraid of me as I am of them. O.K. Maybe that's not possible since I'm dreadfully, unreasonably, terrified of snakes. But I at least want them to want to get away from me the way I want to get away from them! This one just laid there looking at me like it was ready to take me on. So after scooping Zoe up and getting her to safety, I grabbed the shovel and sent this guy to snake heaven too. Quivering and shivering the entire time, mind you, but the alternative was to let it live and encounter it yet another day. That doesn't sit well with me. I prefer to face my fears and get it over with! But I'm not happy because I am afraid I have a whole freaking family cruising around my yard thinking they own the place. So what if they weren't poisonous? They were hideous, slithering, scary SNAKES!! I'm now seriously wondering how stupid it would be to try to sell my house in a depressed housing market just so I can get away from these frightening and insidious intruders! It's stormy weather season here in Oklahoma, so I have to take my computer time when I can get it. We have had some big storms, but I'm very thankful because the really nasty ones passed us by. I feel for the people who have had homes damaged or destroyed by the last few rounds of tornados and storm activity. These awful storms are not just an inconvenience, they can be deadly. Lives have been lost, sadly. We're currently sitting under a tornado warning and the next few days are supposed to be filled with severe storms. I truly hate this time of year because of this weather! Anyway, just wanted to say hello while I had the opportunity because I don't get on-line when the lightening is bad. I have a good UPS, but nothing will really protect your sensitive electronic equipment from some of the direct hits we get around here. I unplug everything and read a lot, even though sometimes it feels as if we're under attack. I guess in some ways we are. I do have a safe room...one of those concrete fortresses built within the house that's supposed to withstand an F4 tornado. It gives me some comfort, but not much. I can't imagine being totally wiped out, being left with nothing...NO BEADS!!!!!! For a young person, it would be very difficult. But as we get older (I tried denial, it didn't work, so yes, I admit I'm getting older, darn it) it's harder to pick up and start all over again. I'm praying I don't ever have to do that. It was hard enough after my divorce and it's still difficult at times. To have your world wiped out to that extent would be such an incredible tragedy! Snakes and storms...maybe I DO need to move!!! I'm SO behind in everything. Getting back to work full-time has been much more difficult than I had anticipated. I am still struggling with a lack of energy, so by the end of the day, I'm totally wiped out. That means I'm not getting much of anything done. A little bit of that goes a long way until now, I'm tired just thinking about how far behind I am. Life moves far too quickly! I have been trying and trying and trying and trying and trying to get a picture of Zoe in mid-air, jumping in frustration because I won't let her go after the squirrels in the yard. After taking countless pictures, I did manage to get one of her a few inches off the floor. My camera has such a delay between the time I click the button and the time the picture is actually captured, sometimes she isn't even IN the picture any more. So, even though this isn't a good representation of the wild dance that she does while watching the squirrels taunt her, you can at least get a tiny idea. She bounces up and down, launching herself straight up a good foot to foot and a half off the floor. She is clawing at the window, pounding on the glass, longing to tear after them, these mischievous interlopers in her sacred territory! 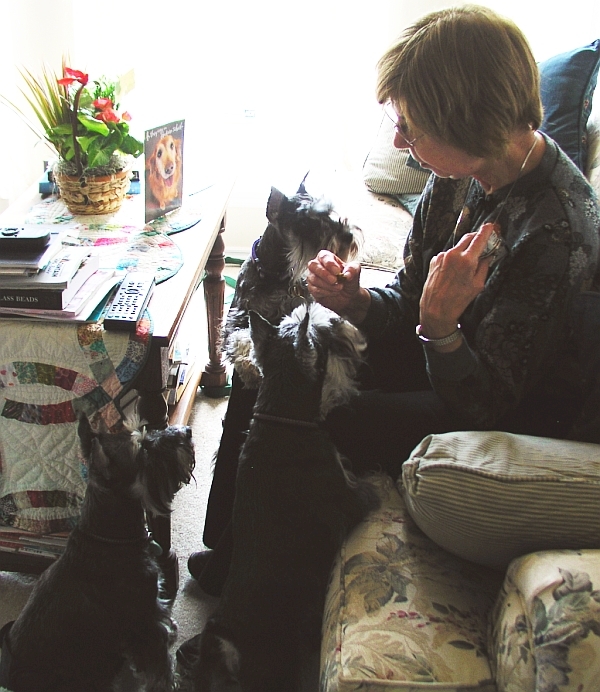 And she barks as Schnauzers do, crowing with her head thrown back. I got a picture of that too! Boing, boing.....woo, woo, woo, woo, WOO! Let me AT 'EM!!!!!! The squirrel went through the slat right before I snapped this picture. Zoe was hot on the trail...or tail...of a big red squirrel who likes to live dangerously. Just another life or death encounter, captured for your viewing entertainment. Happy Memorial Day to everyone. Today is a special day because it's when we remember those who have served in the armed forces to protect the freedom we all generally take for granted. I want to personally thank those who have served and who are currently serving our Country on our behalf. Regardless of your stand on war, past or current, these courageous individuals should be recognized and honored for their sacrifices. If not for them, all of our lives would be very different...and NOT in a good way. Just in time for Memorial Day...I did it!!!!!! I FINALLY captured Zoe in mid-air, doing the squirrel dance!!!! She's watching in the first picture. 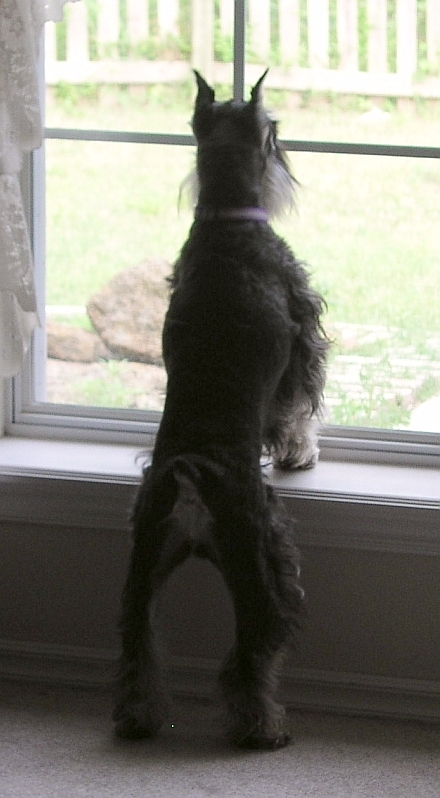 The whole back of my house is windows and they're a perfect Schnauzer height in the living room. 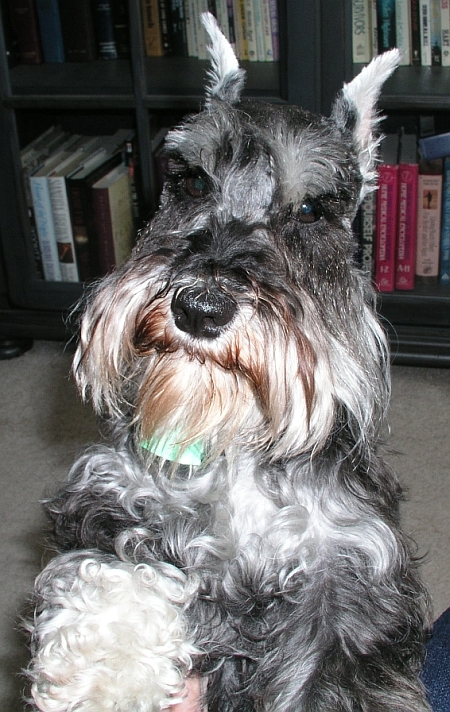 In the master bedroom, they're a little taller, but not too tall for a standing Miniature Schnauzer. It is SO FUNNY to watch her when she really gets worked up, because she "sproings" off the floor like she has mini-springs on her feet. She gets so excited, she just can't contain it and the next thing I know, she's FLYING!!!! Doesn't it look as if she's doing a little Irish step there? I'm thinking she has a future in "River Dance." LOL! Here she is, triumphant, having treed one of those pesty squirrels who constantly dares to invade her territory! The squirrel is there, can you find it? It's not too far from the top of the picture and it's right on the trunk of the tree, kind of leaning over and checking her out. Right after chasing squirrels, visiting with Max is one of Zoe's favorite things to do. Max is a fairly large Chocolate Lab. He sounds very fierce and if you go by sound alone, Max would tear Zoe apart. He outweighs her by a good 80 or so lbs. (his 100 to her 13.5 lbs.). We haven't gotten them together yet, though we would like to, under controlled circumstances, to see if they could be friends. Zoe tries to play with him through the fence, which is actually a little sad. She's a bit of a social butterfly...loves other dogs and craves a playmate. I know she needs a little sister, but I just can't afford that right now. The next best thing would be to have a friend next door!!! Here they are, sniffing each other through the fence. You can see Max through the slats.